Spoiler alert: The majority of drug store pigmentation solutions are rubbish. (There, I said it!) Many of them feel adding the teensiest dash of melanin-inhibiting niacinimide to the mix justifies a skin-tone evening claim which often just isn’t enough. 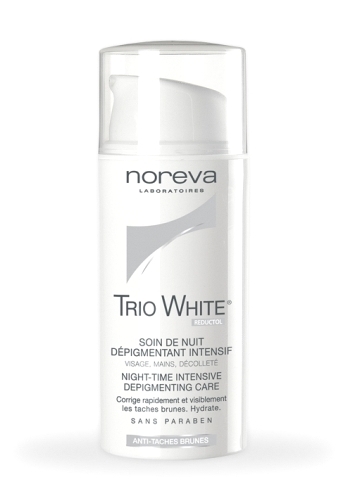 Noreva’s Trio White Night-Time Intensive Depigmenting Care (R339,99, Clicks and selected dermatologists), however, takes a multi-pronged approach and its actives are listed towards the top of their ingredients lists, not the bottom. But to get back to alpha-arbutin. This is a very safe form of naturally occurring hydroquinone derived from Bearberry leaves. Of the two arbutins out there – alpha and beta – alpha is your baby as it’s been clinically proven to inhibit melanin production and is the much more stable of the two. As for ascorbyl glucoside, this is a great antioxidant that can also help inhibit the formation of melanin while assisting with your skin’s natural collagen creation process. Noreva have a day time treatment in this line but the night-time formulation is far superior. Also, there’s nothing stopping you from using it in the day. Just slap on a sunscreen and off you go. The texture is great – a gel-creme that’s light enough to not to encourage the oilies in anyone with a combination skin type. Thanks for the great review. Have you seen results using this product? Am interested to find a product like this that works!! Hi skat! I’ve been using this on my face for about a month and can see the dark patch that always pops up under my one eye is clearing but I don’t want to solely attribute it to the product as I’m also using retinol and AHA so it’s not a proper study, if that makes sense. I did however use the targeted pen from Noreva’s line on three chest freckles last year (all by itself) and it lightened them up like a boss. The pen contains the exact same actives as the night treatment (alpha-arbutin and that stable version of vitamin C) so I know for a fact that Noreva’s combo is a gem. Give it a bash and combine it with an AHA treatment (Environ make some good ones) plus an SPF 50 and you should definitely see a difference. Am always amazed at your knowledge in this field!! Would I use this under, over or in place of my normal night cream? Hi hun! It’s got a light, gel-cream texture so, if you’re oily/combo/’normal’-skinned you can wear it day or night in place of your day or night cream. Just be sure to apply a sunscreen on top of it during the day or wear a foundation that includes an SPF. If you’re very dry, however, and find it’s not hydrating enough for you then use it underneath a more hydrating day or night cream OR team it with a hyaluronic acid serum. can i use this on entire my face ? or only dark sport , freckles ..? Hi there! It’s perfectly safe to be used on your entire face. Thank you for you great insight! I recently discovered Noreva Trio White but I’m nervous to use it. Do you know of any negative long-term effects? Asking because of the hydroquinone. Hi Thanks for the informative insight .Do you have any information on the iklen range esp. the anti brown spot photoprotective cream.Can you combine it with the noreva trio white. If you stop using these products what is the chances of your pigmentation reappearing? Hi Vanessa! Apologies for the slow reply. I haven’t reviewed the brand’s Iklen range but there’s nothing in it that would stop you from combining it with anything from the Trio White collection. Unfortunately, if you’re prone to pigmentation, then inhibiting it is a life long game. Products like these can lighten it, but then if you expose your skin to the sun it will come back. This is why, while you’re treating pigmentation and once it’s gone it’s vitally important that you always wear a high SPF. Also, if you find that the pigmentation comes back despite always wearing sun protection, then chances are the cause is hormonal and this means you’ll have to always use a lightening product, not just as a once off the way you could if you’d gotten your dark marks purely from the sun. Ultimately, if you find it’s a continuous struggle and you’re not getting the results you want from drugstore products then I suggest you make an appointment with a dermatologist or a doc at a reputable clinic like Skin Renewal. They can suggest more potent medical grade products as well as in-office treatments like peels. This will mean a cash outlay, but could ultimately save you a lot of money in the long run because trying a million ineffective drugstore products will end up being more expensive than paying more and getting it right the first time.